Samsung is all set to announce its best phone of 2017, the Galaxy Note 8 which is a follow-up to the last year’s ‘exploding’ Note 7. It is already revealed by the company that the phone is launching at the Unpacked Event on 23rd August. There’ve been a ton of leaks, rumors and speculations about the phone so it seems nothing is left about the that we don’t know about the Note 8. Today, the phone passed the US FCC or US Federal Communications Commission (FCC) with the model number SM-N950U, SM-N950U1, SM-N950W an SM-N950XU. 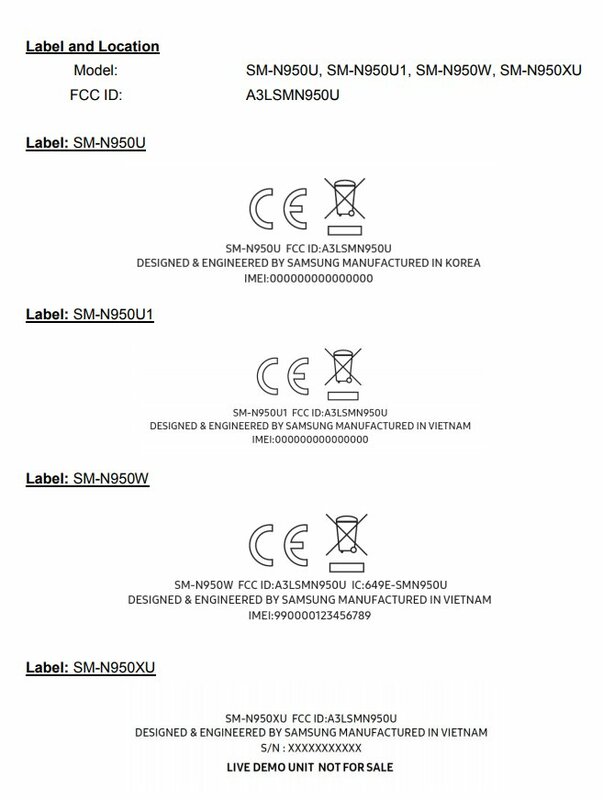 It can be seen that among these four model numbers the SM-N950U is manufactured in Korea while the other three are manufactured in Vietnam. There is nothing so exciting about this listing on FCC, but since it is something you should know, we thought of sharing it. As per the specs, the Galaxy Note 8 is coming with a 6.3-inch Quad-HD Super AMOLED Infinity Display, Snapdragon 835 ( or maybe 836), 6GB RAM, 64/128GB internal storage, dual 12MP cameras, S-Pen, Rear-facing fingerprint scanner and more. What are your expectations with the phone? Do let us know via the comments section.